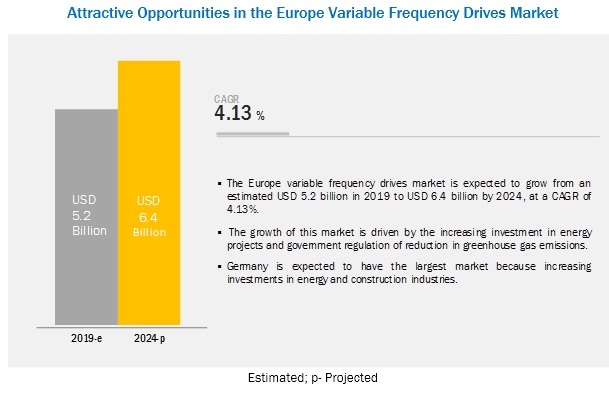 [116 Pages Report] The Europe variable frequency drives market is projected to grow from an estimated USD 5.2 billion in 2019 to USD 6.4 billion by 2024, at a CAGR of 4.13% during the forecast period. This growth can be attributed to factors such as increasing investments in the energy and construction industries and government regulations in reducing greenhouse gas emissions. The report segments the Europe variable frequency drives market, by application, into pump, fan, compressor, conveyor, extruder, and others (crusher & mill and mixer). The increasing pump exports and its use in various industries are likely to drive the pump segment in the Europe Variable frequency drives market. The Europe variable frequency drives market is categorized into low voltage (up to 690 V) and medium voltage (above 690 V). Increase in the usage of variable frequency drives in mining, pulp & paper, water & wastewater, and oil & gas industries is driving the Europe variable frequency drives market in the low voltage segment. Low maintenance and operating cost of medium voltage variable frequency drives in cement & steel industries is expected to drive the medium voltage segment of the Europe variable frequency drives market. In this report, the Europe variable frequency drives market has been analyzed with respect to some major countries, namely, Germany, Russia, the UK, France, Italy, and Spain. Germany is estimated to dominate the Europe variable frequency drives market in 2018. The market is likely to increase due to various factors such as investments in the energy projects and construction industry. Other countries in this region are also investing in energy. There has been an increase in the demand for renewable power generation in the chemical and food & beverage industries, which is also expected to boost the Europe variable frequency drives market in this region. The government regulation for reducing greenhouse gas emissions is also one of the major initiatives for this market. Some of the key players of the market are ABB (Switzerland), Eaton (Ireland), Schneider (France), Siemens (Germany), Danfoss (Denmark), Fuji (Japan), Rockwell (US), Yaskawa (Japan), CG Power and Industrial Solutions (India), Hitachi (Japan), WEG SA (Brazil), and TMEIC (Japan). In February 2019, Yaskawa Europe GmbH, headquartered in Eschborn, Germany, acquired the factory automation business unit of ZF Italia in Assago (Milan). The company increased its overall product portfolio for industrial automation and its presence in the Italian market through this acquisition. In January 2019, ABB launched a series of ACS880 industrial drives and ACH580 Ultra-Low Harmonic (ULH) HVAC drive, which is applicable to all industries and applications to tackle the harmonic issues. In November 2018, Eaton introduced the PowerXL series of variable frequency drives. The variable frequency drive is designed to reduce energy consumption, improve safety, and support reliable operations for the Heating, Ventilation, Air Conditioning and Refrigeration (HVAC/R) market. The drive also includes multiple cooling fan modes for extended temperature applications. In October 2018, Danfoss introduced the 8.5 and 11 Ton of Refrigeration (TR) variable speed scrolls with qualified drives for its application in HVAC systems (chiller/rooftop units and computer room air-conditioners). The report identifies and addresses the key markets for Europe variable frequency drives, which would help manufacturers review the growth in demand. The report addresses the market share analysis of the key players in Europe variable frequency drives market, which would help the companies to enhance their revenues in the respective market. The report provides insights about the emerging geographies of Europe variable frequency drives market. Thus, the entire market ecosystem can gain competitive advantage from such insights. This study involved 4 major activities in estimating the current size of the Europe variable frequency drives market. Exhaustive secondary research was done to collect information on the market, the peer market, and the parent market. The next step was to validate these findings, assumptions, and market sizing with industry experts across the value chain through primary research. Both top-down and bottom-up approaches were used to estimate the total market size. Thereafter, the market breakdown and data triangulation was done to estimate the market size of the segments and subsegments. This research study involved the use of extensive secondary sources, directories, and databases, such as Hoover’s, Bloomberg BusinessWeek, Factiva, and OneSource, to identify and collect information useful for a technical, market-oriented, and commercial study of the Europe variable frequency drives market. The other secondary sources included annual reports, press releases & investor presentations of companies, white papers, certified publications, articles by recognized authors, manufacturer associations, trade directories, and databases. The industry’s supply chain and market size, in terms of value, has been determined through primary and secondary research processes. After arriving at the overall market size-using the market size estimation processes as explained above-the market was split into several segments and subsegments. To complete the overall market engineering process and arrive at the exact statistics of each market segment and subsegment, the data triangulation and market breakdown procedures were employed, wherever applicable. The data was triangulated by studying various factors and trends from both, the demand and supply sides, in the residential, oil & gas, marine, cement & mining, chemicals & petrochemicals, pharmaceuticals, paper & pulp, textile industries, and others. To track and analyze the competitive developments such as contracts & agreements, expansions, new product developments, mergers & acquisitions, and partnerships in the Europe variable frequency drives market. This research report categorizes the Europe variable frequency drives market based on application, power rating, voltage, and country.